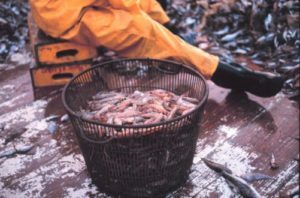 A NOAA-funded study led by Duke University has found that the Gulf of Mexico “dead zone” drives up the price of large shrimp relative to small shrimp, creating an economic impact that directly affects consumers, fishermen and seafood markets. The northern Gulf of Mexico region, known as the “dead zone,” is actually a vast area of hypoxic (low oxygen) bottom water during the summer. Caused by excessive nutrient pollution delivered from the Mississippi River, primarily from agriculture and wastewater, the low oxygen levels are insufficient for supporting most marine life and habitats in near-bottom waters and threaten the livelihood of many fisheries. While the negative effects of these low oxygen waters on marine life are well known, understanding the economic impact and importance has been difficult to achieve. The study, conducted in collaboration with NOAA’s National Marine Fisheries Service and funded by the National Centers for Coastal Ocean Science (NCCOS) provides the first evidence linking Gulf hypoxia to economic impacts. Portion of a shrimp catch in the Gulf of Mexico. Credit: NOAA. Analysis of monthly trends in the price of Gulf brown shrimp from 1990-2010 showed that the price of large shrimp relative to small ones was high during hypoxic events. Previous efforts likely did not track this type of market impact due to a focus on shrimp quantity over fluctuations in pricing. When the dead zone is present, fishermen catch more small shrimp and fewer large ones, making small shrimp cheaper and larger ones more expensive. The total quantity of shrimp caught could remain the same during hypoxic periods, but a reduction in the highly valued large shrimp would lead to a net economic loss. Other fisheries affected by hypoxia likely undergo similar fluctuations, and further studies are needed to understand how lethal and sub-lethal hypoxia effects, along with human decisions, can have an economic impact on fisheries. It is a dynamic and complex issue, and has been a focus of NOAA’s Northern Gulf of Mexico Ecosystems and Hypoxia Assessment Program (NGOMEX), that funded the work.